Hello, and welcome to The Key To Chic. I'm Melissa, and I created The Key To Chic as a personal style diary and creative outlet in June 2011. 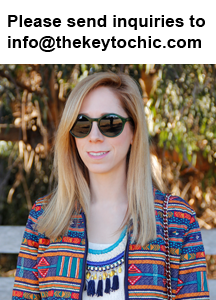 The Key To Chic aims to showcase my colorful personal style against the beautiful backdrop of coastal California. In addition to showing my style, I also share my love of writing, trend forecasting, travel, and photography by publishing fashion reviews, event coverage, travel diaries, D.I.Y. projects, shopping information, and style tips. A little about my educational background: I'm a UCLA graduate who also holds a degree in Fashion Merchandising. With my experience as a fashion forecasting consultant, apparel re-seller and trend spotter, I am passionate about staying on the cusp of emerging style trends. I might also have a shoe addiction (wink, wink). On The Key To Chic, I utilize more than a decade of experience as a professional fashion blogger to feature my fashion forward point of view on all of the stylish things that inspire me. I hope you are inspired, too. I do not accept guest content, so please do not e-mail requesting to write for this site. For more information on advertising and editorial coverage, please read my collaboration guidelines and pitch policy. You can find me on social media @thekeytochic. If you'd like to collaborate or if you have inquiries, please contact me at info[at]thekeytochic[dot]com.